Partners of different zodiac signs bring out slightly different facets of the Pisces personality. Some elements however are fairly common to all Pisces relationships. In many ways Pisces are the most emotional of all the signs. Extremely intuitive and sensitive, they seek romantic love and need a soulmate more than most. 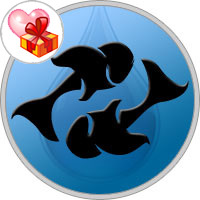 This can be very beautiful for the partner of a Pisces, as their deep love and empathy makes for a very spiritual bond. A union with a Pisces automatically makes their partner feel special and cherished solely because Pisces are so emotive and intuitive. Pisces sometimes need a more direct partner to get the ball rolling. Their shyness can impede the start of a relationship or prolong the initial process, so bear in mind that you may have to open up first and gently nudge your Pisces in the direction of romance. Tread carefully with this special sign and in return you will reap the benefits in your romance. Pisces is a water sign and can sometimes be deemed "flighty". This is only because of their hesitation to open themselves up, since they instinctively realize that once they open up, their heart is pretty much handed over to their lover. Once in a committed relationship, Pisces completely embrace the notion of romance and soulmate love. When they give themselves, they do so fully and hard. They love extremely and fiercely and find it very hard to turn off their emotions should things go wrong. They are likelier to try to work things out than rush off at the first sign of trouble. Their integrity and devotion makes them love strongly and their intuition will make problem solving a bonding experience for their partners. Because of Pisces deep intuition, they may appear psychic. They read the nuances of the unspoken and can see by your body language and what you don’t say, how you really feel. It is almost pointless to try to mislead them, as they will know something is up and the trust of the relationship will be hurt. Being loved by a Pisces is ethereal and soft. This sign is highly emotive and sensitive and tends to be very selfless. They often put their partners needs above their own. This may become dangerous if the match isn’t healthy, as Pisces selflessness can leave them vulnerable to hurt and manipulation. If you love a Pisces, be very gentle and very honest and tactful with them. This sign gives the utmost in loyalty and devotion and their sensitivities should be honored and cherished. Pisces selflessness makes them excellent partners and parents. They love family and tradition and will excel in both arenas. It doesn’t matter how many times Pisces tells or shows Aries that their brashness is hurtful, they fail to recognize that Pisces has a deep level of sensitivity. Aries can be straight to the point in a curt and direct manner with their communication, which can wound the vulnerable Pisces all the way to their inner heart. Pisces hates confrontation, and often, rather than say anything, will sink into their inner space in order to protect their beautiful, but fragile and sensitive self. It can take weeks for Pisces to recover from an Arian outburst, while Aires will forget it in minutes and move on without too much thought. Pisces likes to please, but there is a limit as to how far they will go to stay on Aries good side. Taurus can get frustrated by Pisces lack of commitment. Pisces are dreamers and can get lost in his or her thoughts, and to Taurus, this can be seen as being irresponsible. Because Taurus is so grounded in the real world, he or she may not understand the source of the Pisces turmoil, which can lead to frustration and set the Taurus temper off. The Bull is not easily angered, but once they are, the Fishes’ profound sensitivity can be shattered by a Taurus outburst. Taurus needs to have a level of security around them and Pisces may lean on them a little too much sometimes. Taurus seeks peace and likes to keep things simple and often gets annoyed by the complex and sometimes confusing issues their Pisces partner feels burdened with. This, in turn, makes Pisces feel misunderstood and alone. Also, Pisces needs to be careful of smothering the bull. When Taurus says, “No, thanks,” they mean it. Pisces is way too sensitive for Gemini who changes from being verbal to aloof. As an air sign, Gemini functions primarily in the realm of the mind. The Pisces domain, water, operates on a fundamentally emotional level. Water and air touch the surface of each other, they do not penetrate deeply, and the same may be said for these two. When water and air do blend together it makes for a misty fog, and both these signs can be a bit slippery and evasive when faced with issues that require conflict resolution. Though similar in their dual and mutable natures, Pisces and Gemini need strong complements in the rest of their charts for a love match to really work. The Twins value their freedom and the impressionable Fishes need depth and reciprocation which Gemini may not be able to provide. A Pisces needs reassurance, and it’s doubtful they will receive it from Gemini. Gemini isn’t good with the Pisces emotional nature, and can switch between taking notice and being indifferent - not satisfying for Pisces who likes to analyze everything. When these two click – in an animated exchange of ideas or a shared adventure – it may seem like they’re a great team. The next day, however, may find Gemini in their alternate personality, leaving Pisces insecure, wounded and confused or resentful. The Crab and the Fishes’ worlds are so closely aligned that they can get lost together. It’s such a comfortable and safe existence that taking action can be challenging. Somebody has to manage the practical necessities of life, and whichever among them this responsibility falls to can resent what feels like an unfair burden. Cancer is ruled by the moon and easily succumbs to moods and brooding which can swamp Pisces and drag them both down into the depths. The Fish may get frustrated by the intense subjectivity of their Cancer partners, wondering why the Crab doesn’t see the bigger picture. Red flag alert: the Cancer crab shell sometimes causes them to withdraw, which can wound Pisces more than Cancer realizes. Cancer must learn to trust; the boundaries they use to protect themselves may prove more than even compassionate Pisces can bear. The Fish have their own insecurities, remember. Foreseeable difficulties: Pisces procrastination can cause Cancer to get impatient. Cancer can be also be somewhat demanding, which rubs the fish’s scales up the wrong way. Though often willing subjects to a benevolent monarch, Pisces has their limits and won’t play second fiddle for long if Leo remains insensitive to their need for genuine, emotional intimacy. The Lion plays to the house, and if the audience doesn’t respond, that performance becomes forced, causing the Fish to seek elsewhere for the kind of meaningful communion they long for. Leo must be secure enough in their identity to share the spotlight from time to time. If Leo can manage to laugh at themselves a bit, all the better. Pisces has their own light to shine and needs the support and appreciation that feels so good coming from their lion-hearted mate. Leo is a fire sign of action and Pisces can get lost in a need to overanalyze everything, which leads to trouble. Pisces will ask for advice, but may not do anything about it and this is where Leo gets disillusioned about the relationship. Water and fire together can either sizzle and form stars or extinguish each other completely. Let’s get one thing straight, there is a natural hierarchy in this relationship and Scorpio is the boss. That leaves Pisces to be the more fragile of the two. Both are sensitive signs, but Scorpio is tougher than Pisces and can hide his/her emotions, which the fish finds difficult. Scorpio is the master of disguise, and they’ll act aloof when they’re burning inside. The Fish longs for Scorpio to express their true feelings more; it would be good for both of them. Scorpio needs control and as a fixed sign they dominate Pisces who is more vulnerable and easily swayed. Pisces values the soul resonance they feel with Scorpio so much that they may suffer for the sake of trying to make this relationship work more than they would for another. The Scorpion can, indeed, sting, and if they value the precious gem they have in Pisces, they’ll work hard to keep that tendency in check. Both these two are ruled by powerful emotions – dramatic clashes can leave lasting scars. Sagittarius can neglect Pisces, which leaves them with a pieced heart that shrouds them in sadness. Being apart for too long can cause unrest in the relationship, and with Sag’s desire to travel, Pisces can miss them terribly. There’s a dynamic of friction built into this relationship and even with much in common, their respective natures can rub each other in very uncomfortable ways. Sagittarius may feel bogged down and impatient with Pisces natural rhythm. The Fishes aren’t built to be constantly on the go and besides, what’s the hurry? Pisces can seem just too heavy for the Centaur after a while; the Archer likes to travel light. Pisces perceptions run deep, and to them, Sag can seem to skim along the surface, which disappoints and turns the Fishes off. Pisces, being the zodiac’s most sensitive sign, is easily wounded by the Sagittarius need to tell the truth, no matter how cautious they are. The Centaur may not even realize what they are saying, they simply don’t think before speaking sometimes, but this doesn’t fly with Pisces, who cannot imagine being so immune to another’s sensitivities. Trust to follow and lead on both sides is needed. These signs need to give something up to unite. The Sea-Goat can be very controlling, which makes fluid Pisces tense up and go looking for an escape route. In turn, Pisces needs to get more real about life and give Capricorn some straight answers, rather than be elusive. Pisces must take care not to offend Cap’s pride, and if they give Capricorn reason to suspect infidelity, the Fishes are in for a painful wake-up call. Capricorn can succumb to periods of Saturnine gloom, and Pisces may take it personally or end up playing a martyr role, trying to fix the problem. Pisces loves Capricorn ambition, but if Cap focuses on worldly goals at the expense of the relationship, they could forfeit what may be the love of their life. When Capricorn can learn to let go and enjoy being out of control, and as scary as this may seem, it can make this connection possible. Pisces needs more togetherness than Aquarius is capable of giving. The Aquarian aloofness and free spirit can be a huge problem for a Pisces. The Fish may feel the rug pulled out from under them when Aquarius suddenly turns cold and detached, which they are quite capable of doing. Aquarius may become bored and frustrated with what they see as Pisces propensity for drama, thinking the Fish should be able to simply rise above their emotional turmoil. Aquarius needs a huge amount of freedom and will strain against the Fishes’ tendency to cling. The fish like to be attached rather than detached to their partner in life. They need deep, emotional understanding that feeds their soul, not theoretical or intellectual partnership. From the Water Bearer’s side, Pisces can be more than a bit smothering and needy, triggering Aquarius to withdraw into isolating distance. Not an ideal scenario. Lost in love can equal inactivity – all fun, no work. Their watery, mutable natures may find these two swimming around circles. Their pond may get murky and there’s a risk that nobody gets down to business. Each can leave the responsibilities to the other. Pisces is a dual sign, so there are four fish swimming around and that can get very confusing! Being so sensitive, Pisces often finds the real world more painful than most. This sign is particularly susceptible to all forms of escapism, and if both Fishes are prone to substance abuse this union could end in tragedy. The fish don’t like confrontation, and although this promises to be a peaceful existence, the biggest lessons in life are learnt through hard times, so they can side step the wonders of personal growth. Because they are so similar, they’ll both have to step out of their comfort zones with determination in order to make this relationship work.